Sequoyah was born near Tuskegee, Tennessee around 1770. The name Sequoyah comes from the Cherokee word “sikwa” which means opossum or hog, and the word “vi” which means a place. The name Sequoyah was applied after he had a disabling injury during a hunting accident. Shortly afterward, he became a silversmith. At the time, he was also known by his English name which was George Guist or Guess. Sequoyah's mother was named Wut-teh and she was the niece of two Cherokee chiefs named Old Tassal and Doublehead. 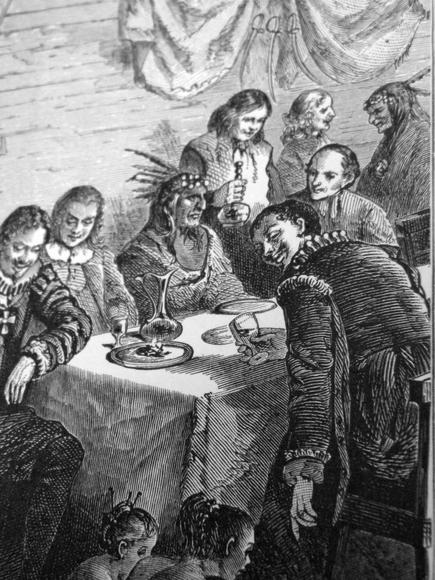 Sequoyah never learned English and he never attended school. He and his mother only spoke Cherokee. As a young man, Sequoyah passed his days tending livestock and working in the family garden while his mother ran a trading post. Then when his mother died he took over her trading post. At the time, he continued working as a silversmith, while also working as a blacksmith as well. He made bridle bites, horseshoes, repaired farm implements, and created tools. His spurs and bridle bites were especially popular because he liked to decorate them in silver. Sequoyah had a lot of contact with white settlers at the trading post and he became obsessed with the fact the the whites could write and read their language. He called the paper that they wrote on “talking leaves.” After a few years he believed that he could do the same thing with the Cherokee language. He began working on a Cherokee syllabary in 1809, using characters from the Greek and Roman alphabet. This was so the Cherokee language could be set in type and read. He spent an entire year trying create a character for each word until he realized that it wasn't practical. During this time he almost starved because he neglected his fields. Then sometime around 1812, Sequoyah moved to Arkansas to join a group of traditional Cherokee under the leadership of Chief John Jolly. The following year he joined a Cherokee regiment, fighting under General Andrew Jackson in the Creek Wars. Sequoyah fought in the Battle of Horseshoe Bend against the Creek Indians. Sequoyah completed his entire syllabary in 1821. His new system was more practical using only 86 symbols, and it could be learned in just a few weeks. At the time, Sequoyah became the first person to complete an entire syllabary of a language. Initially, Sequoyah had trouble convincing the Cherokee living in the Arkansas Territories that he had invented a language. However, once they were convinced the Cherokee attained a higher literacy level than their European counterparts. At the time, the Cherokee language became the first written Native American language north of Mexico. The Cherokee officially adopted the written language in 1825. They wasted no time in adopting a written constitution. Then, just a short time later the Cherokee began operating a bilingual newspaper that was called The Cherokee Phoenix. It survived with the help of missionaries from 1828 to 1834. The Eastern Cherokee General Council awarded Sequoyah with a medal for his accomplishments. It quickly became one of his prize possessions. In 1839, he constructed a log cabin in Sillisaw, Oklahoma where he spent the rest of his life. The log cabin was made a National Historic Landmark in 1965. He was buried with his medal.